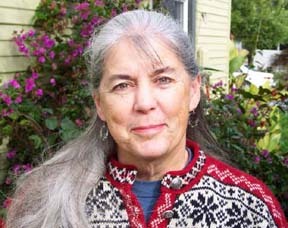 Ann Riley; is a shamanic practitioner, a member of the Society for Shamanic Practitioners, and a graduate of Michael Harner’s 3 year program in Advanced Shamanism and Healing. She is a teacher of Sandra Ingerman’s Medicine for the Earth work, and a graduate of Tom Cowan’s 2 year Celtic Shamanism Program. She has also studied Tibetan Shamanism with Larry Peters and depossession with Betsy Bergstrom. Ann has additional training in Reiki, Kabbalah, and is an ordained minister of the International Assembly of Spiritual Healers and Earth Stewards. Ann was raised on the east coast and graduated from Syracuse University with a BA in Religious Studies. After moving to California she taught elementary school earning a MA degree in Education while studying the Kabbalah and telling stories in her classroom. In 1987 she was introduced to shamanism and has studied and practiced this discipline ever since. Ann facilitated a caregiver group for the Center for Attitudinal Healing for 10 years, and was a Board member of the Storytelling Association of CA. She tells stories at schools, retirement homes, and at the Asian Art Museum in San Francisco. Ann’s shamanic practice includes shamanic counseling, teaching, healing, and ceremony. She incorporates healing stories into her work. Ann sees private clients in El Cerrito, California and teaches classes at various locations across the United States. Please enjoy the video of an interview with Ann discussing her shamanic practice.